During this package tour you will visit the Peterhof Grand Palace was built by the order of Peter the Great, to be the official summer residence of the Romanov’s family. The picturesque Lower park counts 114 various fountains ans 3 large cascades. 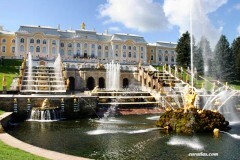 Peterhof is usually compared by it’s beauty and luxury to the Versailes Palace in France. The Paul’s Palace in the city of Pavlovsk was built in 1784 by the architect James Cameron for Paul, the son of the Empress Catherine II. The landscape park of Pavlovsk named to be the largest in Europe, and the best in the means of planning.